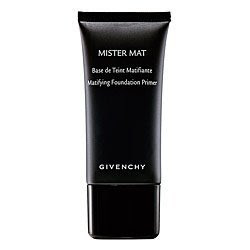 Givenchy Mister Mat Matifying Foundation Primer was first released as a limited edition in Givenchy's fall 2007 Camouflage Chic Collection. The product has gained wide popularity that it has become a permanent item in Givenchy makeup line. Mister Mat contains subtle light blue pearlescent shimmers to diminish the appearance of pores and counteract a dull appearance. In addition, it is formulated with silicon gum extracts to help hydrate the skin and plant extracts to control the skin's sebum production. This primer is in opaque clear, and has a light floral scent. It goes on colorless. The texture is velvety smooth. It has a soft gel consistency that makes it glide on over the skin smoothly. It keeps the skin breathable, airy and comfortable. As soon as it is applied on my skin, it eliminates the oil and mattes out the shine. It minimizes the look of fine lines and pores, and gives the complexion a smooth, even and clean appearance. Also, it brightens up my skin naturally. So the skin appears more radiant and luminous. Mister Mat has a good oil control ability and provides a long-lasting mattifying effect. But I would apply powder foundation or face powder over Mister Mat to cover the imperfections and enhance the sebum control ability. I have dry to normal skin with some sensitive skin issues. This primer tends to dry my skin if I apply too much of it. Therefore, I usually apply a pea-sized amount for just the T-zone and cheeks. Overall, I am happy with Mister Mat Matifying Foundation Primer. The texture is soft, light and breathable. It reduces the appearance of fine lines as well as pores nicely, and leaves the skin smooth and even. Most of all, the primer absorbs the excess oil efficiently and provides a good mattifying effect. I would apply powder foundation or face powder after Mister Mat to ensure a smooth, flawless finish and a perfect oil control effect. During the day in hot weather, it only requires a few touch-ups with powder foundation when my T-zone and cheeks get slightly shiny. The makeup on my face remains fresh without being cakey throughout the day. i never look into givenchy stuff much but i am now interested in primer so i will look into this product. thanks for a very detailed and insightful review. I have this and it doesn't control oil for my oily-tone. It does keep makeup fresh though, but ysl matt touch remains my HG for a mattifying oil control primer. Wow. This is great. I will try aleast once. You should try Juice Beauty's SPF 30 mineral light moisturizer. Its a light tinted moisturizer with SPF and it is amazing. It is certified organice and created from a juice base! This is also available at Sephora. If you prefer a primer under your make-up try Juice Beauty's antioxidant serum! LOVE THIS STUFF. Thank you very much for stopping by! I am so glad that you enjoyed reading this review. Do let me know what you think of this primer if you get to try it out. I am sorry to hear that Givenchy Mister Mat Matifying Foundation Primer doesn't work for you. I have been thinking of trying YSL Matt Touch primer for a while. Thank you so much for recommending me the Matt Touch primer. I will give it a try when I go to the YSL counters next time. Thank you for your comment! I hope this primer will work for you!!! Thank you very much for recommending me SPF 30 Mineral Light Moisturizer and Antioxidant Serum. I hope I can get a chance to try them out. Thanks a lot for sharing the nice information.